Why make soft sculptured cupcakes? I'm not sure but it is a challenge! 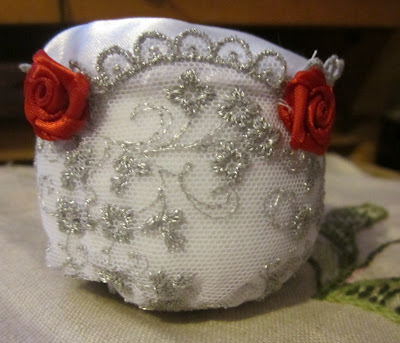 This started as a project for the Marie Antoinette Christmas tree. "Let them eat cupcakes!" So I started by making them in off white felt but my first one failed for two reasons, first it had straight sides and the second reason was it didn't fit in the cupcake lace. 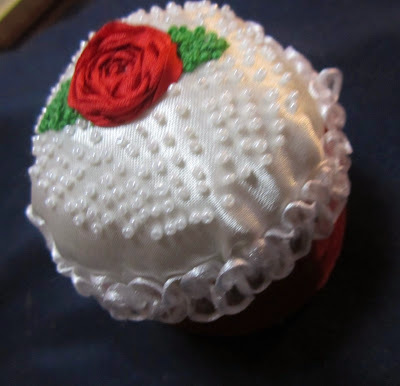 First try at a cupcake with spider web rose and size 15 beads. 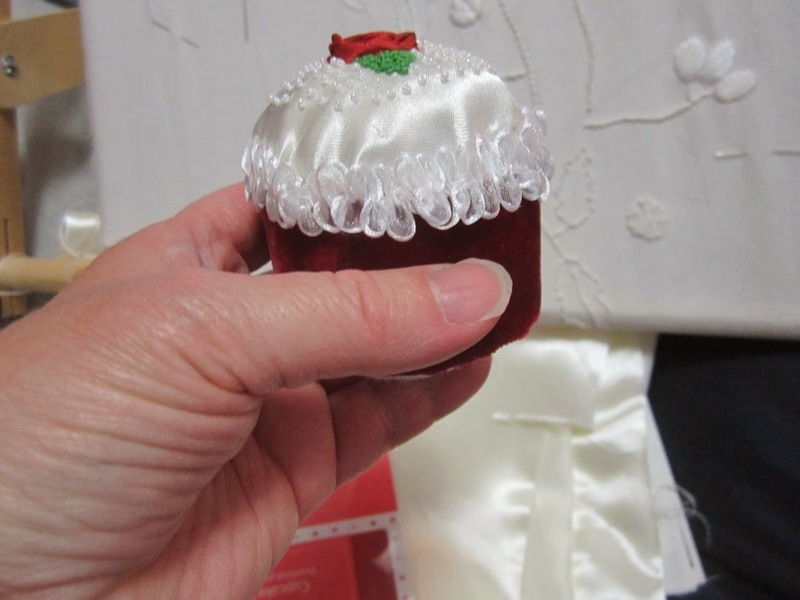 Side view of a cupcake showing red velvet ribbon sides. So I started again making the cupcake a bit smaller and didn't put anything on the sides and it fit inside the cupcake lace! Then that led to the problem of the sides being the off white color of the felt. This is something I am still working on. a zig-zag runched ribbon flower. The second cupcake also looked too plain. So I started a third cupcake and wrote down the instructions. This is for your own use and I hope the instructions will help you with your own designs. I like the soft squishy look of the cupcakes but by putting light weight cardboard inside they will look crisper! If you have some improvements on this I would love to hear from you. Hope you enjoy! 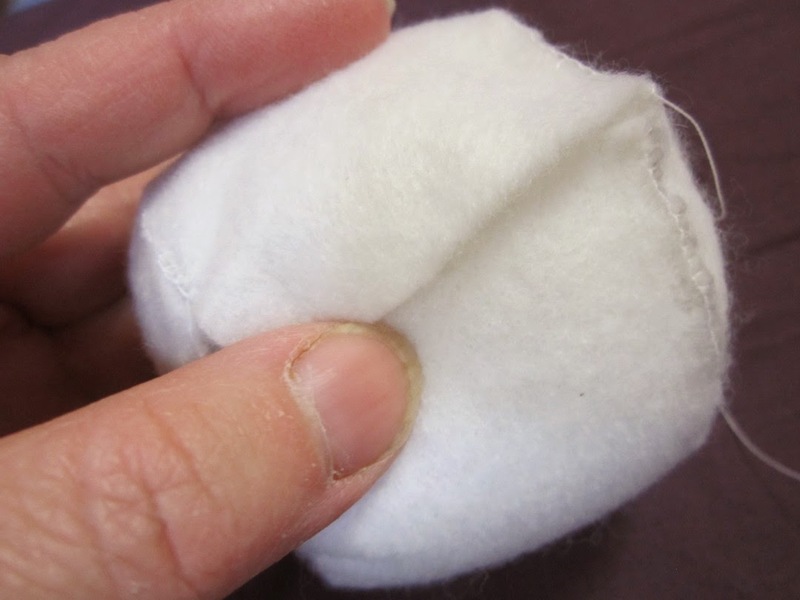 Step 1: Cut a 2.5 inch and 2.25 inch circle out of felt. Then cut a felt strip 1.75 x 8 inches. When sewing the circles to the strip you will not use all of the strip. Better to have too much of the side strip then to run out. Starting with the smaller circle hold it against the long side of the strip. Start buttonhole stitching the pieces together starting 1 inch from the corner of the strip. 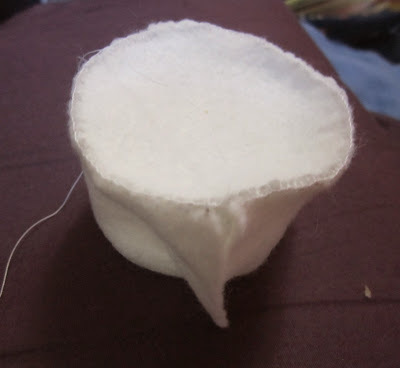 Buttonhole stitching felt circle to felt strip. 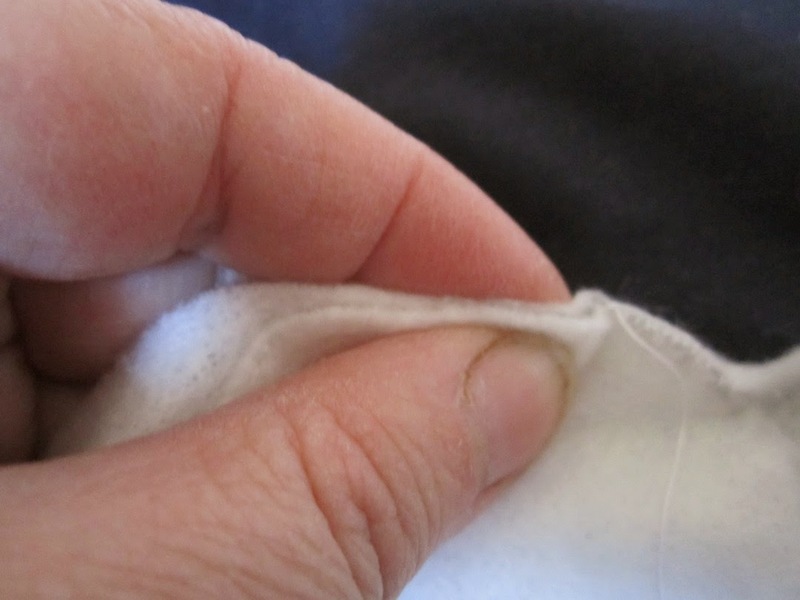 While stitching ease the pieces together by squeezing them between your thumb and finger. Try to pinch up a little of the strip while sewing. This gives the cupcake more of a baked feel somehow. 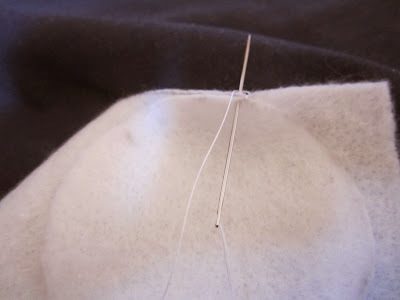 Pinching the circle and strip together while buttonhole stitching them. 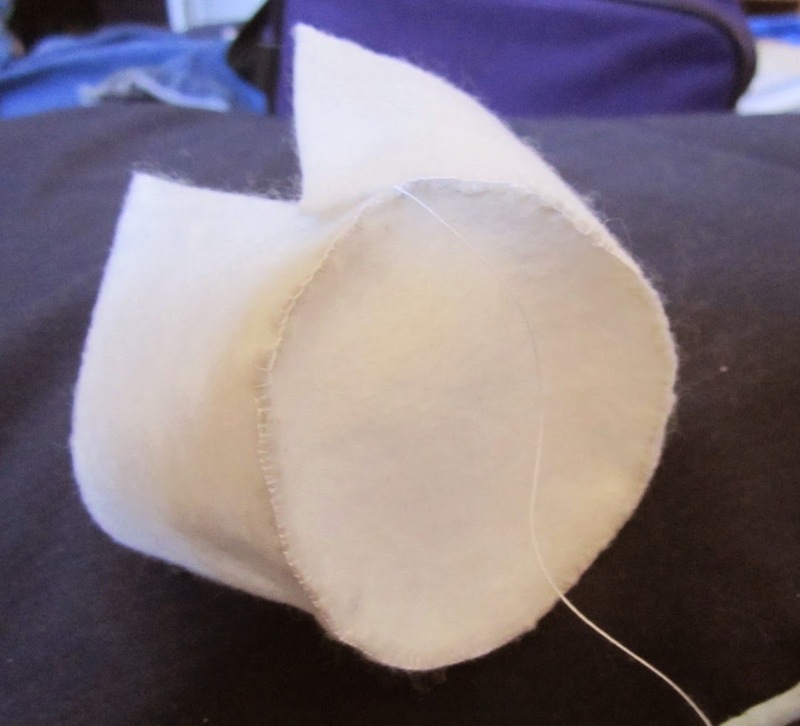 Once the strip is attached to the smaller circle attach the larger circle to the other side of the long strip. Small circle attached to strip. Large circle partially attached to the strip. Cupcake with both circles attached to the strip. Notice that there is some leftover strip. Next if you have any leftover of the felt strip cut it short leaving enough to fit into the opening. If you don't like the buttonhole stitching you may want to turn the cupcake inside out. I like the little wrinkles so I leave the stitching side out. You can also slip in a 2.4 inch piece of lightweight cardboard if you want a firm cupcake. Now stuff the cupcake with fiberfill but if you are going to put a cupcake lace around it keep trying on the lace while stuffing. When you have it stuffed, you need to sew the cupcake closed. I use a simple running stitch. It is a good idea to squeeze the cupcake and size it to the cupcake lace again. Holding the strip edges together to close with a running stitch. 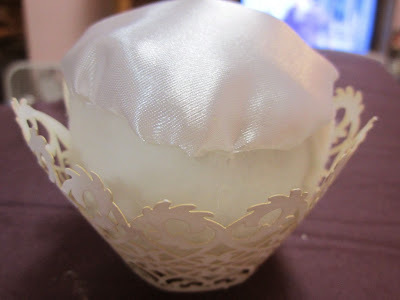 Resizing the cupcake to fit the cupcake lace. The next step is to add some padding to the top of the cupcake. 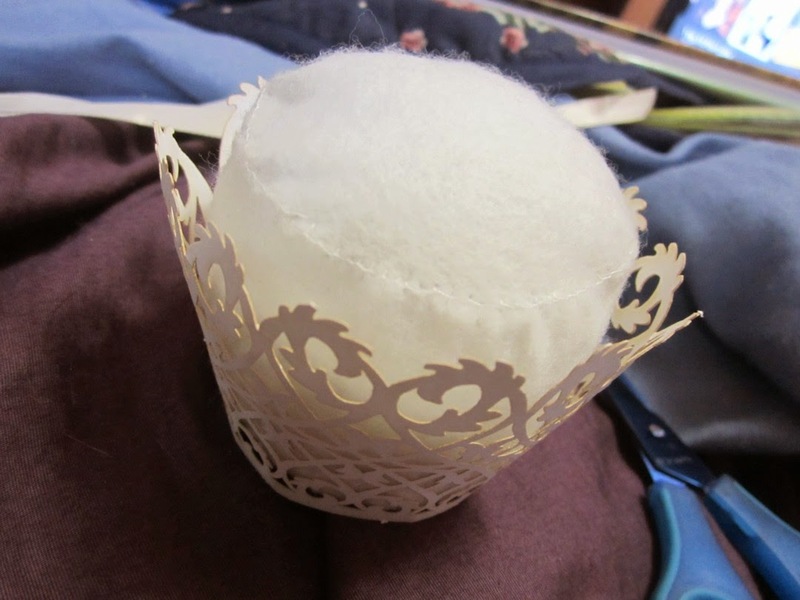 I do this separately because stuffing the cupcake enough to have a nice round top makes it too fat to fit in the cupcake lace. 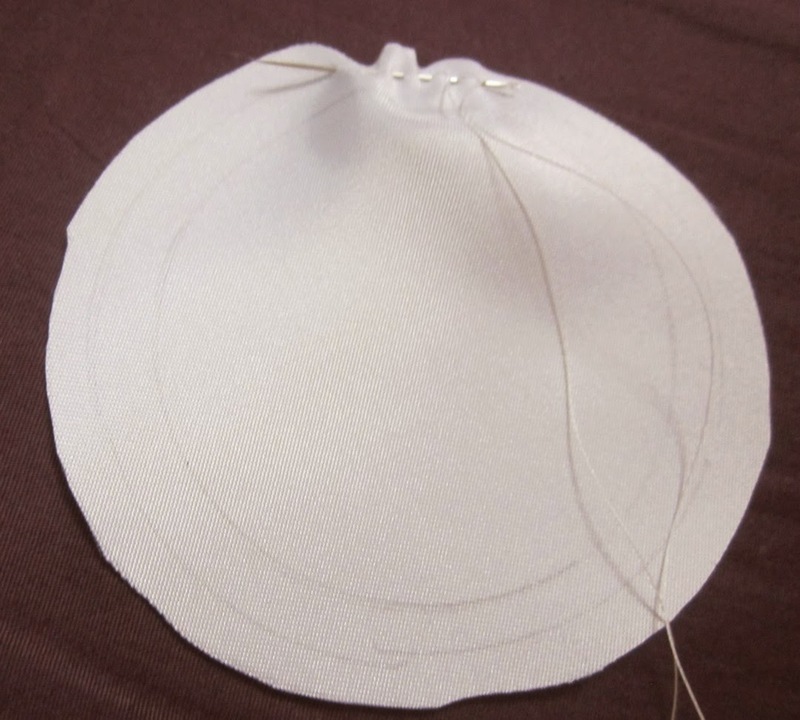 To pad it cut three circles, 1.5, 2.0 and 2.5 inches from felt. Then stack them and place on the top of the cupcake with the largest circle on top. 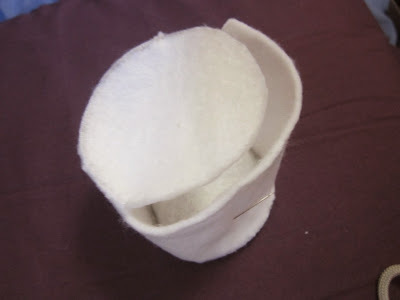 Buttonhole the felt padding to top of the cupcake. Now for some fun decorating the cupcake! Now for the frosting. 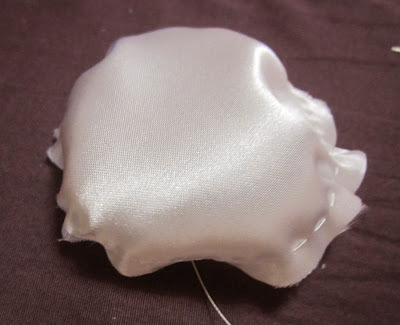 I've been using satin for the frosting it is so smooth and shiny, but you can use any fiber that you want. Cut a 4.0 inch circle of fabric and mark a 3.0 inch circle inside. 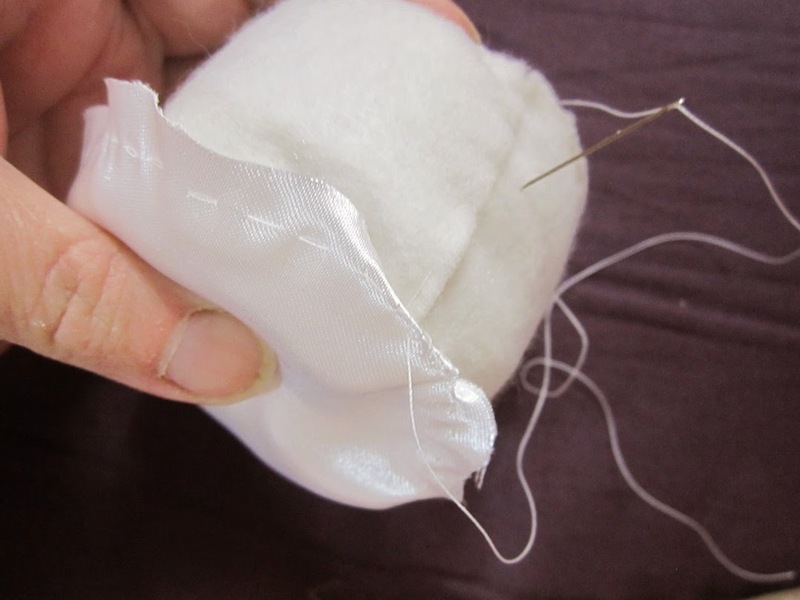 Sew a running stitch between the outside and the 3.0 inch mark. Like making a yoyo. Use a running stitch between the 4.0 and 3.0 inch marks. 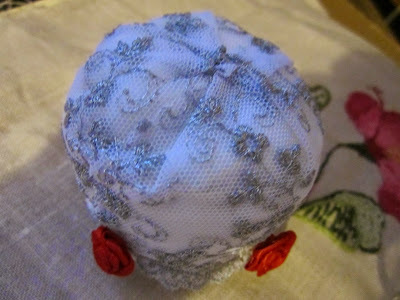 Pull the thread and create a little cap for the cupcake. 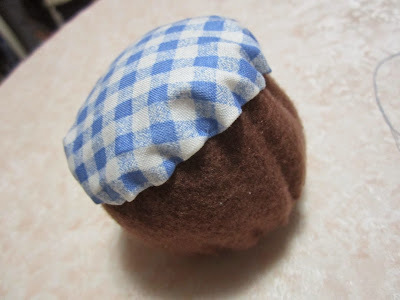 Tuck under the fabric edge and sew it as invisibly as you can to the cupcake top. Think of frosting dripping over the edge of the cupcake. So don't try to make this step perfectly even or it won't look as much like frosting. 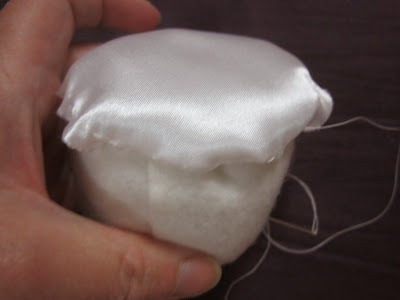 Sewing the satin frosting cap to the cupcake. 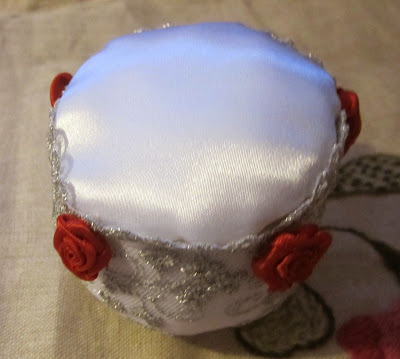 Felt cupcake with satin frosting ready to decorate! Now is the real fun of making the cupcake decorating it! Use your imagination! Here are some of the cupcakes I've made. be cute with yellow daisies or inside a picnic basket! 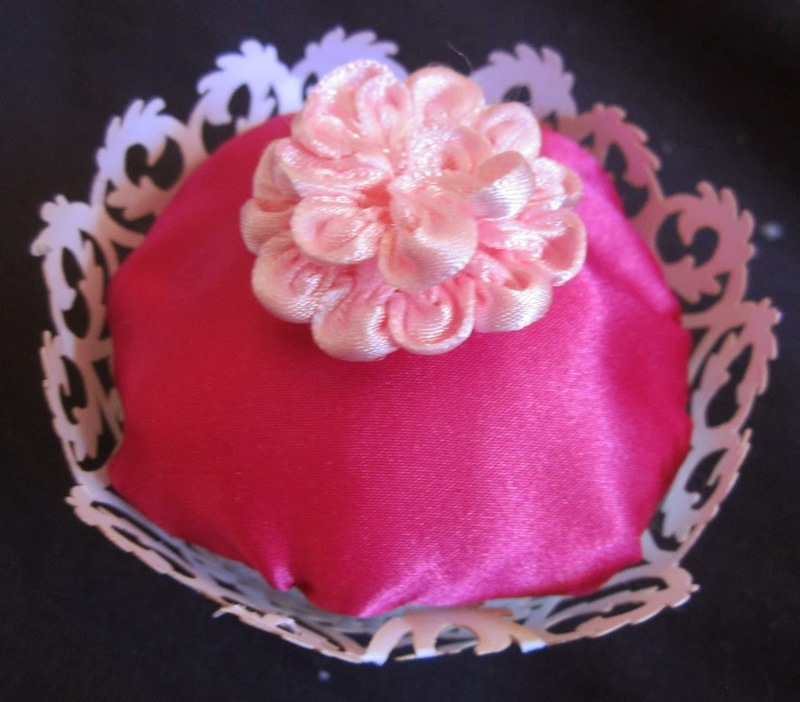 Satin covered cupcake with spider ribbon rose and a sprinkling of size 15 beads. Around the edges is a zigzag runched sheer white ribbon. Hot pink satin frosting with a pink zig-zaged runched flower. top doesn't have the felt circles padding it. The sides are decorated with a strip of silver lace and purchased ribbon roses. I will insert some cardboard so the cupcake sits better! Hope you enjoyed the tutorial and make soft sculptured cupcakes of your own!